Summer Solstice began this year on June 21 at 7:28 EDT in the morning. Sol + stice derives from a combination of Latin words meaning "sun" + "to stand still." 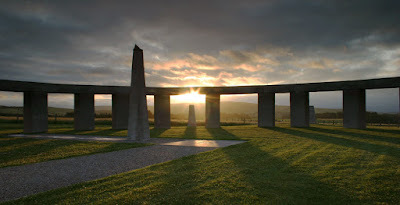 It is the longest day and shortest night of the year. The sun will gradually begin making it's way down to its southernmost point resulting in the second Solstice, the Winter Solstice, which will be the shortest day and longest night of the year. This year I decided I'd have my tarot cards read as a gift to myself. 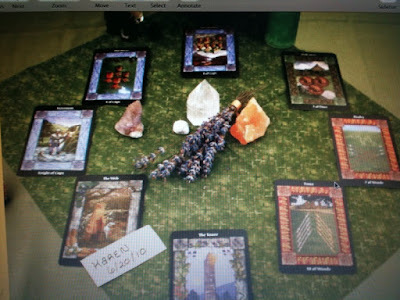 On Etsy, I found Helene, Intuitive Goddess, and had her do a reading for me using a layout called Morgaine's Wheel. She asked for my name and birthdate and that is all. My friends, THIS GIRL IS GIFTED! First, I received a lovely PDF with a photograph of the entire layout. Then each card is identified and she writes about its meaning and how she intuitively feels about it. She also begins each reading with a meditation and automatic writing giving the reader a bit more information. I'm putting a link HERE so you can see just how much information you get. Here is a quick little list of what she says and how it corresponds to me so you can see how right on she is. "New Beginnings and Starting Over". My word of the year is Recreate. "Where are the Girls?" 4 grandsons - 0 Grand-daughters (although, according to the ultrasound, there will be one in early November. Water around me - I do live by the Ocean and have several people in my life that are Scorpio's. Real Estate is playing a BIG part in our lives right now mostly our kids are having trouble keeping their homes due to so many Foreclosures. On and on she hit facts right on the head. I can't even begin to tell you how accurate she was. It was a GREAT reading. There are many areas I can be working on between now and Fall Equinox, my next seasonal reading. If you are interested in Tarot, Universal Guidance, even if you know a little something about Tarot and doing your own readings like I do, having your cards read by someone who knows NOTHING about you but your name and birthday can be a way for you to get an objective, unbiased reading. Be sure to do a little checking into the reader you chose to make sure they have been doing it a while with positive feedback. Just because someone has a deck of Tarot cards, an advertisement and a fee does NOT mean they know anything about reading or listening intuitively. Better yet, please go over to Etsy and check out Helene.... she offers many different readings in all price brackets. I am not being paid to say this or getting anything for free! You will LOVE your reading! You were a pleasure to read for!